There’s good news for those wanting to head out after a tiring day of work, and relax to some nice tunes played live. Cafes and bars in Hyderabad have realised that in this relationship economy — it is important to give customers a delightful experience. Therefore, they’re taking care of a lot of details, and of the feel when they bring in live acts by local and international artists. 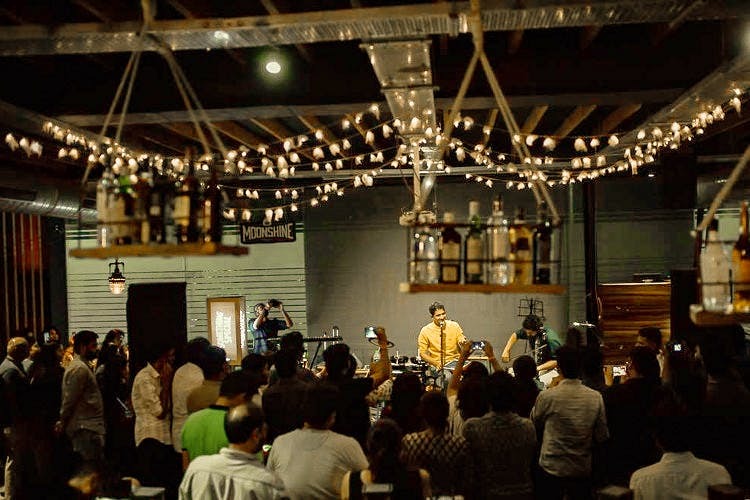 Looking at how beautifully Hyderabad’s music scene has evolved over the past few years, we have curated a list of places in the city where you can enjoy your money’s worth of encounter with live music. Located behind Flying Spaghetti Monster, this open-air bar is where you can go with bae to enjoy some classy music over drinks and dinner. Popular artists like Ben Bohmer have previously performed here and Murthovic, an eminent techno artist from the city often performs his sets here. Tabula Rasa is not afraid to experiment with niche genres while also providing a platform for upcoming artists from all over India. So, it’s safe to say that Tabula Rasa is everyone’s cup of tea. Your portal to the Prohibition Era — this retro pub and lounge cafe has hosted some of the best cover bands, regional musicians, indie and footwork artists in the country. The Moonshine Project believes in letting you have an illicitly good time — and so they often hold stand up comedy sessions, spoken-word poetry events, open mics and karaoke nights as well. Go here with your squad for a massive blast. Heart Cup Coffee was much more popular for its live music before other venues overtook it. However, not too long ago, HCC launched an underground venue called Alt-Space to push the focus on alternative performing arts. It is a movement in its own right, and you could be a part of it. Check out their calendar for live-gigs (which mostly happen on Saturdays and Sundays) and flock here for the cheap beer, great food, and a wonderful evening. Be it a weekday or the weekend — Air live is never not crowded. This lounge in Jubilee Hills offers an impressive view of the city lights, a dim-lit ambiance that is perfect to enjoy the live music here. Being a favoured choice for an evening of live music among locals, this place certainly makes the cut as it continues to present fusion, folk, Bollywood, and rock music. In an upscale neighbourhood of Jubilee Hills, this relatively new bar is attracting a lot of eyeballs and eardrums. Not just for its decor and ambiance, but for its #backyard which is becoming a hub for live-music lovers. This place has different sections for those who want to have a laid back evening, and for party animals. Their live music section is pretty and covers seating for a small crowd. Hidden spiral staircase, secret passcode, brilliant music scene and an interesting mix of a crowd — Giggle Water enjoys a prime status in speakeasy bars in Hyderabad. And for a fairly good reason. This bar runs from Wednesday to Sunday, and no matter what day, it's packed to the brim. Their live music scene is quite happening with events like Gin & Jazz Nights with Pranati Khanna, Underground Techno and more. Slide into their Instagram DMs and see if you can get access.